Stretch Skull Head Bracelet. Cute and Premium Quality. Size: Approx. Width: 12mm; Thickness: 6mm;. Material: Stainless Steel. Colors: Silver. Length: Approx. 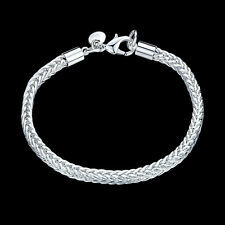 • Bracelet Size : approx.8.5" L, 7.5-8mm W ,7.5-8mm T ( T he widest point ). • Bracelet Color : Silver. • Bracelet Weight : approx.28 grams. • Material: Stainless Steel. 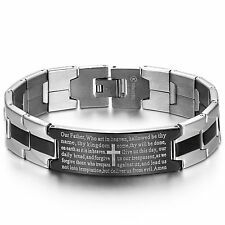 • With Stainless Steel Stamped. Electroplated with 14k yellow gold. Made out of SOLID 925 Sterling silver. This isn’t brass or stainless steel it’s 100% 925 Silver! Diamond cut on one side and flat on the other. 925 Silver Jewelry. Men's Gold Silver Tone Cross ID Stainless Steel Twisted Cable Bangle Bracelet Color: Silver&Gold Material: Stainless Steel Specification:7.28"(18.5cm)*0.39"(1cm) Weight: 36g Package Includes: 1pc*Bracelet 1pc*Blue Gift Bag This bracelet is 100% Brand New And High quality.Its special design will make you look unique. It is a good gift for your lover,family,cowoker,friends.It make you charm and elegant. Metal Stainless Steel Metal Purity Unknown Style Bangle Main Color Silver&Gold Main Stone No Stone Material Stainless Steel Brand Unbranded MPN Does not apply EAN Does not apply UPC Does not apply. Polished Men's Silver Tone Heavy Stainless Steel Curb Chain Bracelet Link Bangle Color: Silver Material: Stainless Steel Specification: 9.05"(23cm)*0.59"(1.5cm) Weight: 84g(Approx) Quantity: 1 x Bracelet This bracelet is 100% Brand New And High quality.Its special design will make you look unique. It is a good gift for your lover,family,cowoker,friends.It make you charm and elegant. Brand Unbranded Style Chain Metal Stainless Steel Main Stone No Stone Main Colour Silver EAN Does not apply UPC Does not apply MPN Does not apply.